Ace musician, distinctive vocalist, skilled songwriter, inspired band-leader, knowledgeable historian and exciting entertainer, Marty is a genuine country icon. Steeped in country music history, in a career stretching back to the early 1970s, he has perfected a near flawless integration of southern rock, bluegrass, blues, honky-tonk, boogie and rockabilly. 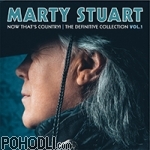 This 44 track Best of covers his entire career including tracks from his highly acclaimed latest album "Way Out West". Page generated 23.4.2019 at 03:04:56 in 0.167 seconds.